Curated, Comprehensive, and Comparable intelligence on all the developments that are taking place within the food and beverage sector, with respect to blockchain adoption. You cannot afford to miss the enterprise blockchain action in the Food and Beverage sector! Blockchain can solve many problems for the F&B sector. Establishing provenance of food products, eliminating adulterated and counterfeit products, provisioning faster and fairer payments to growers, reducing trade promotion costs, and controlling reputational damage from product recalls. These are just a few use cases of this technology for the food and beverage sector. Many big and small enterprises from across the food value chain are undertaking blockchain projects in search of viable use cases. While there is no dearth of information on blockchain and its benefits for food and beverage sector, it is very difficult to get updated, complete, comparable and structured information on how various enterprises are using this technology. 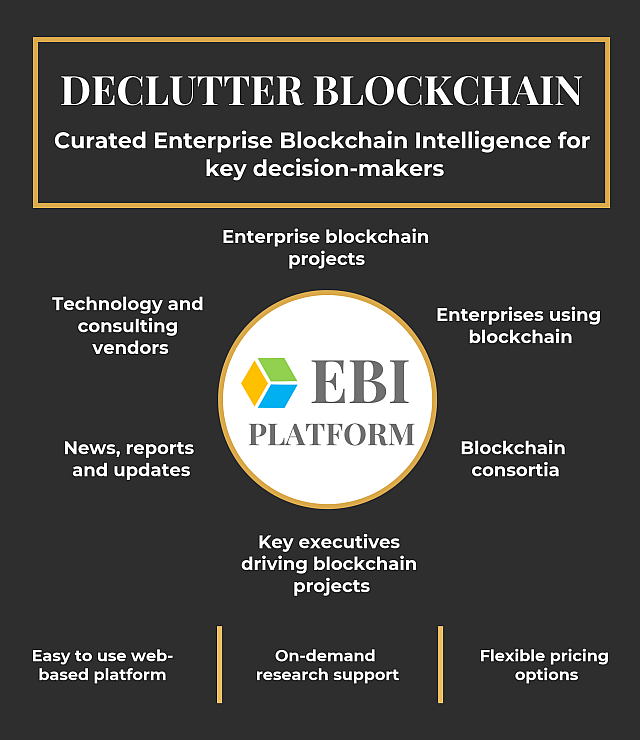 Enterprise Blockchain Intelligence (EBI) Platform: A one-stop intelligence platform. that allows you to access, analyze and compare information on all projects and consortia, as well as identify key executives that you should engage with to take the next informed step. List of all blockchain projects focused on the F&B sector. Details about each project – participating enterprises, vendors, the platform used, focus use case, details about the progress of the project, key executives driving the project, and relevant sources. List of all enterprises participating in these projects. List of all technology and consulting vendors participating in these projects. List of all key executives that are driving these projects. List of third-party reports/ research on blockchain adoption for the sector. Bios of experts that you can consult for your technical, legal, and strategic advisory. Introductory offer: Use coupon code EARLY20FNB to get 20% off if you subscribe before 3rd May 2019.